One of the most important features to look for in a car holster are neodymium magnets if it’s a mount. They are the strongest permanent magnet available on the commercial market. Another important feature to look for in a vehicle holster is multiple magnets. A mount can spin around when only one magnet is used. Thus, you’ll want multiple magnets to keep your firearm securely in place. Below we have listed six of the best vehicle holsters based on customer ratings, durability, and quality. Half of the holsters are mounts whereas the others don’t require screws for installation. With a 35 lb rating, Lirisy Gun Magnet Mount is the best vehicle holster for a variety of weapons. You can conceal a rifle, shotgun, revolver, or pistol in the holster. It has a low profile, making for easy concealment. 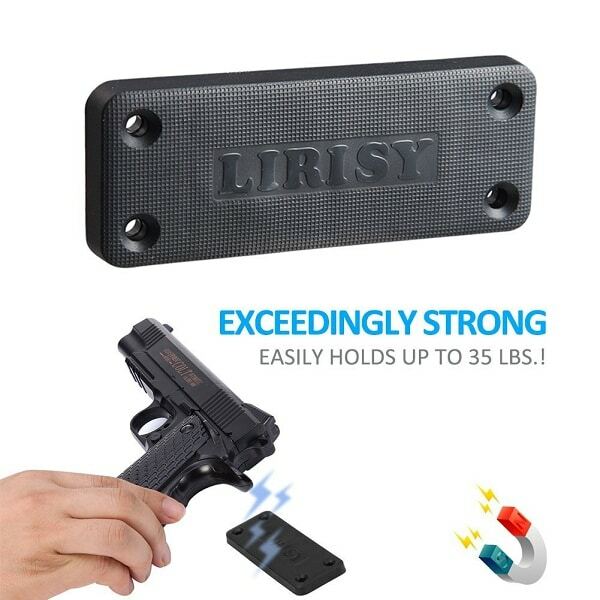 The Lirisy Gun Magnet Mount also features soft rubber coating that protects your firearm from scratches. It comes with screws, so you can quickly install the mount in your car. The design minimizes the chance of gun spinning. 3.74″ x 1.5″ x 0.33″ design. Large surface area for great grip. The Keeper MG Magnetic Gun Mount can holster all types of firearms in your vehicle, including shotguns, rifles, pistols, revolvers, and handguns. Many brands work with the vehicle holster, such as Winchester, Smith & Wesson, Beretta, Remington, Mossberg, Ruger, Sig Sauer, and more. 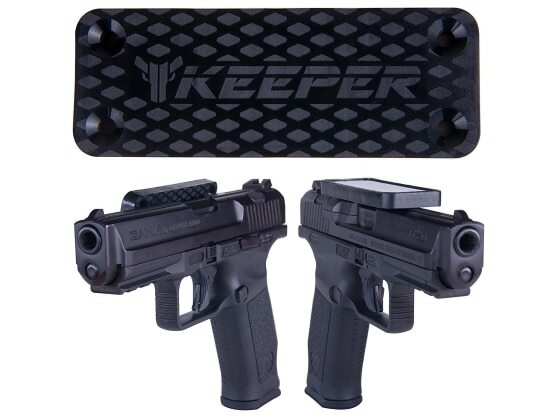 The Keeper MG Magnetic Gun Mount vehicle holster is easy to install. Its rubber coating protects your gun from scratches. The gun mount comes with four black self-tapping screws for installation. It has a rating of 35 lbs. These features allow the N35 Neodymium magnets keep your firearm straight and provide a strong grip. Holds all types of firearm. The Ragnar Industries Tac-Mag Gun Magnet vehicle holster has a 25 lb rating. It’s weatherproof and shockproof, making it a durable product. For greater contact, the gun magnet features neodymium magnets. This vehicle holster comes with a 100% lifetime guarantee. 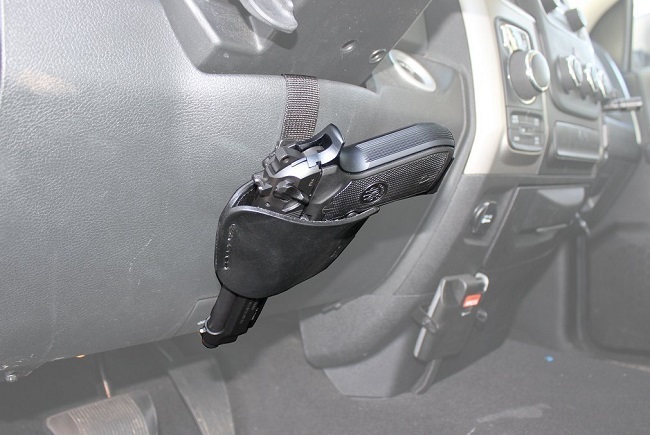 You can choose to mount your gun either perpendicular or parallel with this car holster. It’s strong enough to hold almost any type of gun, including .45s, Glocks, and XDMs. The Ragmar Industries Tac-Mag Gun Magnet is made of a special polymer that prevents marring of your gun. 2.39″L x 1.04″W x .79″ design. Features the strongest type of permanent magnet . The CCW Tactical Car holster is designed to conceal your gun under the steering wheel. Other places in which it’s safe to place the holster is around the headrest or arm rest. This car holster has an adjustable wrap-around strap that you can use to store pepper spray, a knife, a flashlight, or a gun. 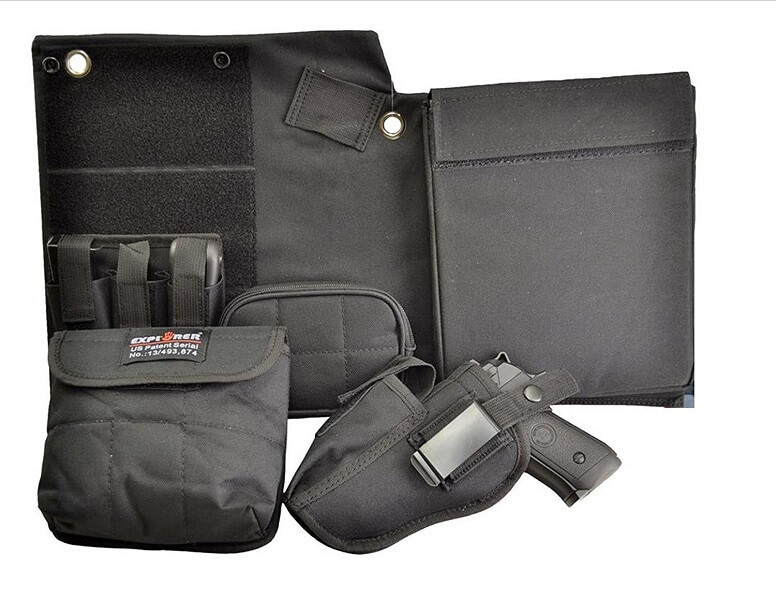 The CCW Tactical Car Holster is ambidextrous, so both left and right handed people can use it. Its design and materials prevent your firearm from being scratched. This car holster is ideal for people who don’t want to install a vehicle holster via screws or adhesive. It’s suitable for use in UTV and ATV vehicles as well as your everyday car. Almost any type of gun fits in the car holster, such as full size pistols, revolvers, compact handguns, and small subcompact handguns. Like the Ragnar Industries Tac-Mag Gun Magnet Vehicle Holster, it comes with a 100% lifetime guarantee. 6 x 5.5 x 2 inches design. Made of 80% leather and 20% nylon. Adjustable wrap-around strap with durable clasp. A variety of gun models fit in the Explorer CH88 car holster, such as Smith & Wesson, Beretta, and Glock. Different from the previous car holsters on this list, it has four elastic hooks for securing the panel in your vehicle. The car holster also has three removable magazine holders. Made of heavy duty polyester 600 D, the Explorer CH88 Car Holster is durable. Other items you can store in this car holster is a cell phone, knives, pepper spray, and stun guns. 1 x 1 x 1 inches design. Heavy Duty Polyester 600 D.
Made in the USA, the Grand Gun Works Ride Ready gun holster is good for people who prefer buying American-made products. It’s made of genuine leather, a durable and stylish material for holsters. 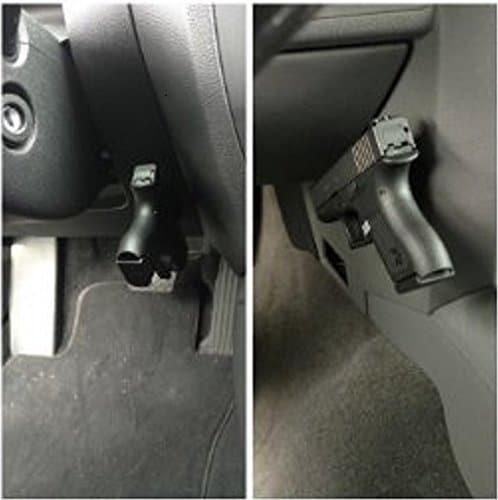 You can set up the holster under your steering wheel. 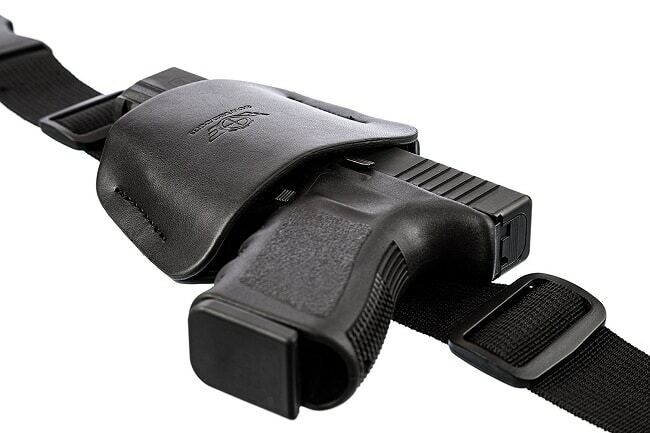 The Ride Ready gun holster universally fits small and large auto handguns. Small frame revolvers fit in the car holster too. 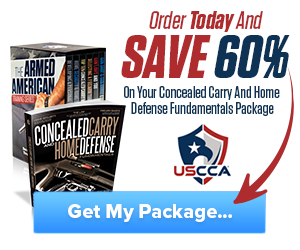 Examples of guns you can store in the holster are calibers .380 acp, 45 acp, 9mm, and 40 S&W. The Grand Gun Works Ride Ready Gun Holster is fast and easy to install. It comes with a lifetime warranty as well. Fits most auto handguns, small and large. Any of the above vehicle holsters are great choices. To narrow down your choice, ask yourself if you’re okay with installing a holster via screws. Those who don’t want any type of damage done to their vehicle should use the Grand Gun Works Ride Ready Gun Holster, Explorer CH88 Car Holster, or the CCW Tactical Car Holster. From there, it’s a matter of choosing what fits your weapon and personal style. Which vehicle holster do you like the best and why? Let us know in the comments below. Hey Buddy!, I found this information for you: "Top 6 Best Vehicle Holsters to Keep You Safe While Driving". 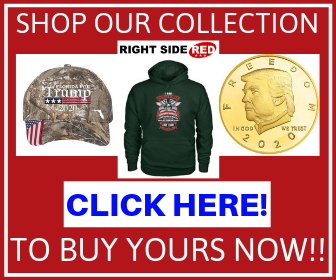 Here is the website link: https://thegunrights.com/best-vehicle-holster/. Thank you.